If you think drones are only good for capturing aerial photographs, then you’re probably living under a rock! Slowly their presence is growing in other areas, notably in construction industry. It is safe to say that drones have revolutionized the construction and engineering fields by boosting the productivity and profitability. With the application of Unmanned Aerial Vehicles a.k.a. 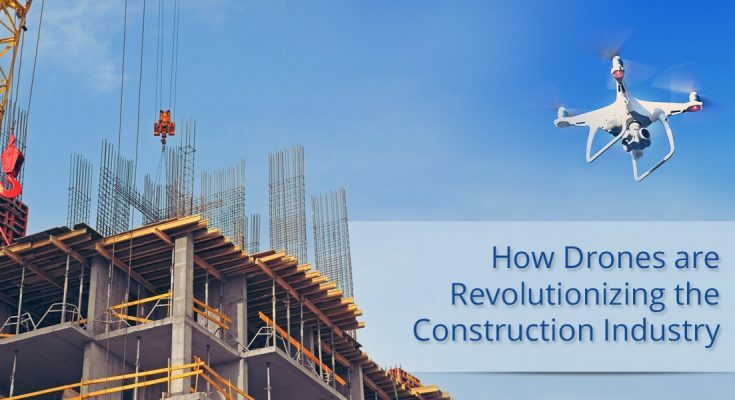 drones, general contractors as well as construction firms can save considerable time for better productivity, just as they do with construction management software. A report from PwC states, the value of labor and allied services that will soon be taken over by drones’ accounts to $ 127.3 billion. Interestingly, more than one-third of this number falls into the construction and infrastructure industry. The Federal Aviation Administration has predicted that the US will have 7 million drones in the air by 2020. Any construction work that can be completed in a few months at present, would take years previously. And this process could after maybe 20 years down the line, get completed within a matter of few days only. Drones are used in inspections, surveillance, and the movement of materials among other tasks. Now some are even equipped 4K UHD cameras and infrared capabilities, so there is no need to keep the construction sites lit up during the night for security purposes. Having drones deployed at the job site keeps contractors at 24/7 watch. Hence, helping in saving costs by reducing resource expense. Drones can also be of great help for moving materials from one level to another, instead of assembling cumbersome cranes to do the work. Using drones will also help improve the productivity of the workers, as drones can reach places that may be difficult or unsafe for human exploration. However, it is not yet something to completely replace manual labor with but will definitely help streamline the work processes. Project managers often must handle multiple projects at a time. During such occasions, meeting deadlines can be a real challenge. But when it is not possible to travel to both the places drones are able to collect or capture information and send it back to a remote device used by the project manager. If backed with the right software and tools, a drone can easily map underground gas lines, electricity supply lines, water lines and sewer systems. The drones are capable of surveys and can gather immaculate site information. In the construction industry, undiagnosed, tiny problems can sometimes snowball into uncontrollable fatalities. Drone surveillance not only saves cost but also helps create a safe environment for workers and ensures orderly equipment maintenance to prevent accidents. Surely people don’t like to be watched all the times, like lab rats. Drones offer discretion to the necessary evil that is surveillance. There are numerous applications for drones that can help save time and cost. With UAV’s monitoring and tracking, construction data can be collected for analyzing. Industry insiders predict that drones will continue to improve speed and accuracy in the next few years. Furthermore, drones are projected to play a critical role in smart city applications, for their contributions in geospatial and surveillance activities. Management duties like crowd management, environmental and agriculture management, urban and civilian security can all be performed with modern drone technology. Additionally, we can monitor natural disaster, situations like floods, fires, and earthquakes and help in saving lives. Here’s Why Smart SEO Auditor Is Ideal For Website Audits! How to decide between Shopify and WordPress? All You Need To Know About Eligible Rules And Regulations For Free Television License! Using more of the internet to grow your business. Should You Consider Windows 10 Pro Over Home Edition? Find Here!